The set includes a creamer and a sugar bowl with a lid. SKU: PCB05. Categories: Party & Event, Serving Equipment, Coffee/Tea. Tags: coffee, creamer, silver, sugar bowl, tea. This coffee pot has a 42 ounce capacity. This coffee pot is strictly a serving pot that will maintain the coffee’s temperature. It will not brew nor heat the coffee in any way. The coffee cup is rented separately. All dishes come to you you clean and ready to use. All that we ask of you before return is that you rinse the dishes and return them in the crate or box in which it came to you. 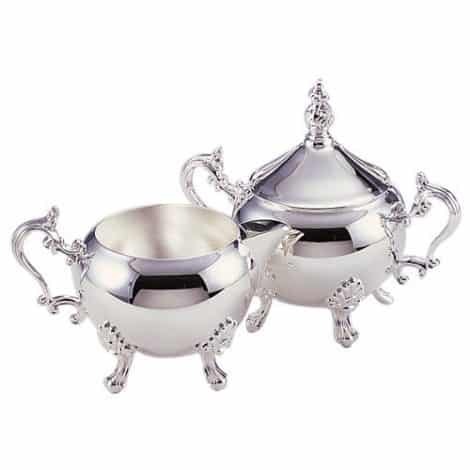 We also carry a matching creamer or silver sugar spoon which are rented separately. All glassware comes to you you clean and ready to use. All that we ask of you before return is that you dump out the cups and return them upright in the crate or box in which it came to you.